กระซู่, แรดสุมาตรา หรือ แรดขน (อังกฤษ: Sumatran Rhinoceros; ชื่อวิทยาศาสตร์: Dicerorhinus sumatrensis) เป็นสัตว์เลี้ยงลูกด้วยนมในอันดับสัตว์กีบคี่จำพวกแรด กระซู่เป็นแรดที่มีขนาดเล็กที่สุดในโลก และเป็นแรดเพียงชนิดเดียวที่อยู่ในสกุล Dicerorhinus ที่ยังคงดำรงเผ่าพันธุ์ มาจนถึงปัจจุบัน มีลักษณะเด่นคือมี นอ 2 นอ เหมือนแรดแอฟริกา โดยนอจะไม่ตั้งยาวขึ้นมาเหมือนแรดชวา นอหน้าใหญ่กว่านอหลัง โดยทั่วไปยาว 15-25 ซม. ลำตัวมีขนหยาบและยาวปกคลุม เมื่อโตเต็มที่สูง 120–145 ซม. จรดหัวไหล่ ยาว 250 ซม. และมีน้ำหนัก 500-800 กก. ↑ van Strien, N.J., Manullang, B., Sectionov, Isnan, W., Khan, M.K.M, Sumardja, E., Ellis, S., Han, K.H., Boeadi, Payne, J. & Bradley Martin, E. (2008). Dicerorhinus sumatrensis. In: IUCN 2008. IUCN Red List of Threatened Species. Downloaded on 28 November 2008. ↑ 3.0 3.1 3.2 3.3 3.4 Rookmaaker, L.C. (1984). "The taxonomic history of the recent forms of Sumatran Rhinoceros (Dicerorhinus sumatrensis)". Journal of the Malayan Branch of the Royal Asiatic Society. 57 (1): 12–25. ↑ The Golden Peaches of Samarkand: A study of T’ang Exotics (1963), p 83. Edward H. Schafer. มหาวิทยาลัยแคลิฟอร์เนีย เบิร์กเลย์ และ ลอสแอนเจลิส First paperback edition: 1985. ↑ 9.0 9.1 9.2 9.3 9.4 9.5 Dinerstein, Eric (2003). The Return of the Unicorns; The Natural History and Conservation of the Greater One-Horned Rhinoceros. นิวยอร์ก: โรงพิมพ์มหาวิทยาลัยโคลัมเบีย. ISBN 0-231-08450-1. ↑ Rookmaaker, Kees (2005). 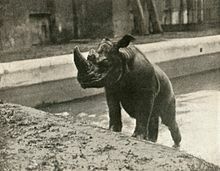 "First sightings of Asian rhinos". In Fulconis, R. Save the rhinos: EAZA Rhino Campaign 2005/6. London: European Association of Zoos and Aquaria. p. 52. ↑ 13.0 13.1 13.2 13.3 13.4 13.5 13.6 van Strien, Nico (2005). "Sumatran rhinoceros". In Fulconis, R. Save the rhinos: EAZA Rhino Campaign 2005/6. London: European Association of Zoos and Aquaria. pp. 70–74. ↑ Asian Rhino Specialist Group (1996). Dicerorhinus sumatrensis ssp. sumatrensis. 2007 IUCN Red List of Threatened Species. IUCN 2007. Retrieved on January 13, 2008. ↑ Asian Rhino Specialist Group (1996). Dicerorhinus sumatrensis ssp. harrissoni. 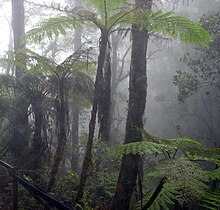 2007 IUCN Red List of Threatened Species. IUCN 2007. Retrieved on January 13, 2008. ↑ Groves, C.P. (1965). "Description of a new subspecies of Rhinoceros, from Borneo, Didermocerus sumatrensis harrissoni". Saugetierkundliche Mitteilungen. 13 (3): 128–131. ↑ Asian Rhino Specialist Group (1996). Dicerorhinus sumatrensis ssp. lasiotis. 2007 IUCN Red List of Threatened Species. IUCN 2007. Retrieved on January 13, 2008. ↑ Lacombat, Frédéric (2005). "The evolution of the rhinoceros". In Fulconis, R. Save the rhinos: EAZA Rhino Campaign 2005/6. London: European Association of Zoos and Aquaria. pp. 46–49. ↑ Groves, C. P. (1983). "Phylogeny of the living species of rhinoceros". Zeitschrift fuer Zoologische Systematik und Evolutionsforschung. 21: 293–313. ↑ 24.0 24.1 Cerdeño, Esperanza (1995). "Cladistic Analysis of the Family Rhinocerotidae (Perissodactyla)" (PDF). Novitates. American Museum of Natural History (3143). ISSN 0003-0082. ↑ 27.0 27.1 27.2 27.3 27.4 27.5 27.6 27.7 van Strien, N.J. (1974). "Dicerorhinus sumatrensis (Fischer), the Sumatran or two-horned rhinoceros: a study of literature". Mededelingen Landbouwhogeschool Wageningen. 74 (16): 1–82. ↑ 30.0 30.1 30.2 Foose, Thomas J. and van Strien, Nico (1997). Asian Rhinos – Status Survey and Conservation Action Plan. IUCN, Gland, Switzerland, and Cambridge, UK. ISBN 2-8317-0336-0. ↑ 36.0 36.1 36.2 36.3 36.4 36.5 Borner, Markus (1979). A field study of the Sumatran rhinoceros Dicerorhinus sumatrensis Fischer, 1814: Ecology and behaviour conservation situation in Sumatra. Zurich: Juris Druck & Verlag. ISBN 3-260-04600-3. ↑ 44.0 44.1 Roth, T.L. (2003). "Breeding the Sumatran rhinoceros (Dicerorhinus sumatrensis) in captivity: behavioral challenges, hormonal solutions". Hormones and Behavior. 44: 31. ↑ Rookmaaker; L. C. (1998). 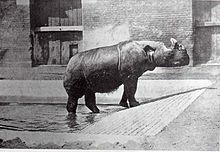 The rhinoceros in captivity: a list of 2439 rhinoceroses kept from Roman times to 1994. Kugler Publications. pp. 125–. ISBN 978-90-5103-134-8. ↑ Rabinowitz, Alan (1995). "Helping a Species Go Extinct: The Sumatran Rhino in Borneo". Conservation Biology. 9 (3): 482–488. doi:10.1046/j.1523-1739.1995.09030482.x. ↑ "Andalas - A Living Legacy". Cincinnati Zoo. สืบค้นเมื่อ 2007-11-04. ↑ "It's a Girl! 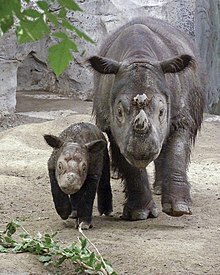 Cincinnati Zoo's Sumatran Rhino Makes History with Second Calf". Cincinnati Zoo. สืบค้นเมื่อ 2007-11-04. ↑ "Meet "Harry" the Sumatran Rhino!". Cincinnati Zoo. สืบค้นเมื่อ 2007-11-04. ↑ Watson, Paul (April 26, 2007). "A Sumatran rhino's last chance for love". The Los Angeles Times. สืบค้นเมื่อ 2007-11-04. ↑ "Emi, In Loving Memory". Cincinnati Zoo. สืบค้นเมื่อ 2016-02-16. ↑ "LAST SUMATRAN RHINO IN WESTERN HEMISPHERE IS LEAVING THE CINCINNATI ZOO". Cincinnati Zoo. สืบค้นเมื่อ 2016-02-16. ↑ "The Littlest Rhino". Asia Geographic. สืบค้นเมื่อ 2007-12-06. ↑ "The Forgotten Rhino". NHNZ. สืบค้นเมื่อ 2007-12-06. ↑ "Rhinos alive and well in the final frontier". New Straits Times (Malaysia). July 2, 2006. ↑ "Rhino on camera was rare sub-species: wildlife group". Agence France Presse. April 25, 2007. ↑ Video of the Sumatran Rhinoceros is available on the World Wildlife Fund web site. หน้านี้แก้ไขล่าสุดเมื่อวันที่ 9 ธันวาคม 2561 เวลา 18:27 น.